WHAT MAKES A PERFECT JOURNEY? IT’S THE PEOPLE THAT MAKE THE DESTINATION. WE PROVIDE TRAVEL GUIDES BY LOCAL SOULMATES AROUND THE WORLD — DESIGNED, VETTED, AND SERVED UP ON A GOLDEN PLATTER JUST FOR YOU. CURATED 24-HOUR TRAVEL GUIDES BY LOCAL SOULMATES. HANDPICKED SPOTS ONLY. WE KNOW YOUR TIME IS PRECIOUS, WE LET YOU MAKE THE MOST OF IT AND HAVE A GRAND JOURNEY. EXCEPTIONAL PLACES AROUND THE WORLD. FROM BIG CITIES TO NATURAL PARADISES. NEW GUIDES WEEKLY. FILTER YOUR LOCAL SOULMATES BY INTERESTS. FROM ROMANCE TO ADVENTURE. FROM FOOD TO FASHION. FROM BASICS TO LUXURY AND EVERYTHING IN-BETWEEN. SLEEP IN SOULFUL HOTELS AND SPACES. STRAIGHT TO YOUR MAPS.ME APP – FOR OFFLINE MAPS AND NAVIGATION. 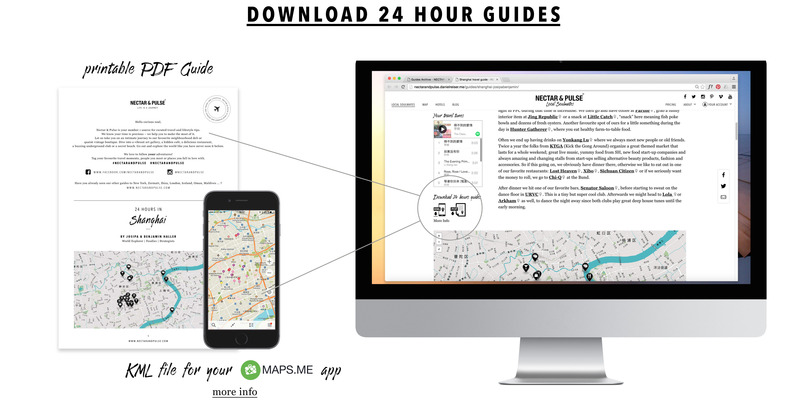 FOR TRAVELLING THE ANALOGUE WAY, PRINT YOUR 24-HOUR TRAVEL GUIDES AS PDF FILES.